Kraft and white. I love this combination. It’s clean, crisp, and just perfect! This card can be used for so many different occasions and can be put together in just a few minutes. Emboss a panel of kraft card stock with floral folder and attach chevron ribbon. Attach panel to a kraft card. Punch out a scalloped circle and emboss with dot folder. 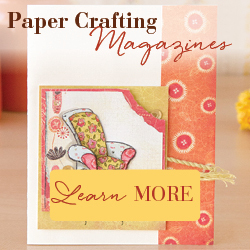 Punch a smaller circle of white card stock and attach to the scalloped circle. Attach this piece over the ribbon with pop dots. Stamp “just for you” with white ink on kraft card stock and emboss with white powder. Punch out and attach with pop dots to white circle. And that’s it ~ you’re done!